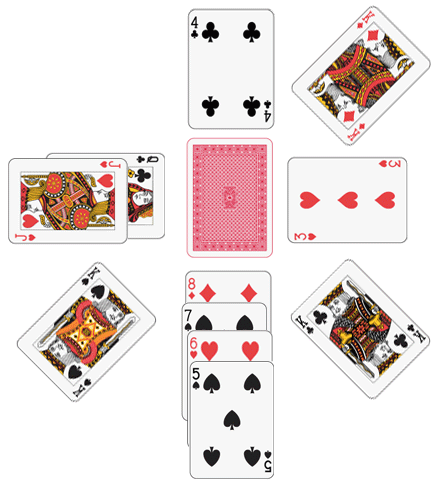 Reminiscent of solitaire, Kings Corner is a multiplayer game where players attempt to get rid of cards from their hand by playing them to piles of alternating red and black cards. The object of the game is to be the first player to get rid of all the cards in your hand. Any cards added to the foundation piles during the game should be placed in an overlapping manner so that all cards in the pile can be seen. A player may play a card from their hand onto one of the existing foundation piles on the table. The card played must be the next lower in rank to the card on top of the foundation pile, and it also must be the opposite color. For example, a red 8 (heart or diamond) could be played onto a foundation pile that had a black 9 (spade or club) on top. A player may play a king from their hand onto the table to start a new foundation pile. Only kings may be placed on one of the four diagonal “corners” of the tableau (i.e., NW, NE, SW, SE). Cards may then be added to the new foundation pile by any player in the same manner as the other foundation piles. A player may move an entire foundation pile if the bottom card of a foundation pile is the opposite color and one rank lower than a card on top of another foundation pile. For example, if one foundation pile contains a black queen, a red jack, and a black 10, and another foundation pile contains a red 9 and a black 8, the pile with the 9 and 8 could be moved and placed on top of the other pile. Note that if one of the original foundation piles contains a king on the bottom of the pile, a player may choose to move that pile to an empty corner location. If one of the original four foundation piles becomes empty (because the cards in it were moved onto another pile), a player may play any card from their hand to the empty space, thus starting a new foundation pile. After a player has performed all the actions they wish (which could be none), they end their turn by drawing 1 card from the draw pile and placing it in their hand. If the draw pile runs out, do not reshuffle. Players simply end their turns without drawing. The game ends as soon as one player plays the last card from their hand. That player is the winner. Occasionally the game may end with no players being able to (or being unwilling to) play any further cards. Keep score over several games (rounds). Before the first round begins, players should decide on a game-ending score (such as -25). At the end of each round, players with cards remaining in their hands receive negative points. Kings are worth -10 points and all other cards worth -1 point each. After each round, the player to the left of the current dealer becomes the new dealer. Once one player exceeds the game-ending score, the game is over and the player with the highest score (the least negative points) is the winner. If a player draws a king, or has a king in hand, they must play it to a corner at the first opportunity. At the beginning of the game, when drawing to create the four original foundation piles, if a king is drawn it is immediately placed in one of the corners. A new card is then drawn to replace it. Each player draws a card at the beginning of their turn instead of at the end. In this variant, the game-ending score is 250. After each round, points are scored for the cards remaining in each player’s hand. Aces score 25 points, face cards (King, Queen, Jack) score 10 points each, and all other cards score their face value. Once one player reaches 250 points, the player with the lowest score is the winner of the game.